Tobacco-Stained Mountain Goat would never have ended up anywhere near the final package that surfaced on April Fool's Day 2011 if not for the essential input of its editor, Kristopher Young—the author of Click. "My erstwhile collaborator over the past three years of the novel's gestation... [has] invested so much of his own ideas that the story has definitely shaped up as collusion," Bergen says. Also on board is the fantastic imagery from graphic artist and cartoonist Scott Campbell. "I merely outlined the concepts I wanted," says Bergen, "namely the goat in a smoking jacket with a ciggie and a martini, along with a femme fatale goat in cocktail gloves exhaling the Japanese kanji zuzushi [shameless/impudent]. Scott conjured up the magic." 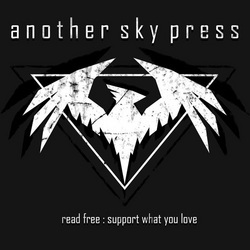 Massive thanks too for the people involved from Another Sky Press including Christine, Bob, Justin & Jesse.